Want to know a secret to writing great copy for your website? I don’t mean you leave the pages blank. You need the words, of course. But not all of them will come from you, and not all of them will come from writing. Copy is not written. If anyone tells you ‘you write copy’, sneer at them. Copy is not written. Copy is assembled. This sounds like a nice quote to share in your Facebook group, but it actually has a concrete application with an Excel sheet and stuff. So, even if you can’t (or want to) become the next Eugene Schwartz you can use this method to write great copy for your business website faster and with less agony. But first, a short, almost magical (yet, absolutely relevant) story. I visited a friend the other day, and when I entered the kitchen, I saw a bottle of Hennessy on the table. Wow. Cognac’s reading your mind. And you haven’t even started drinking yet. I knew what they did there and how they did it, but still felt the magic. If it hadn’t had my attention already, this would do the trick. Want to know how you could make your prospects pay more attention to your offer and for it to resonate better? And no, you don’t need truckloads of money to make this happen. All you need is an Excel sheet and this strategy in place (plus, some time to make the strategy work). Last week, I was writing new copy for a homepage of a business coach. State before to describe the state their prospects or their businesses were before they reached out to that business coach. Needs to describe what they were looking for in terms of a solution to their struggles. Reservations to describe what could make them hesitant to hire a business coach. Experience to describe how their experience of working with that business coach was. State after to describe how they felt afterwards. Then, I opened a file with the testimonials, and, while reading the testimonials one-by-one, copy-pasted phrases that fit the columns. State before: Lost, stuck and anxious / tired of unpredictability / no clear direction. Needs: Passive income / sustainable business / individual approach (from the coach). Reservations: Difficult to find someone I trust / price. …while countering the reservations and offering social proof using the excerpts of the testimonials as, well, testimonials. State before: Lost, stuck and anxious / no one to help / tired of unpredictability / no clear direction / overwhelmed. Needs: Stable income / sustainable business / less hustle. * – – taken as it is; – paraphrased. So now, when her prospects read the exact same words they’re thinking already, they’ll feel like they met an old friend who understands them. And you’d rather hire a friend than a stranger, amiright? 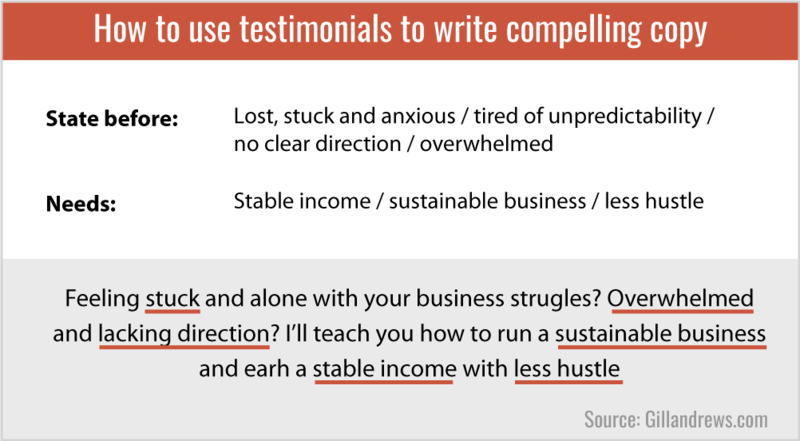 A note of caution: You would need at least 15-20 testimonials to get a realistic picture. If you have 2-3, it’s a good start but be careful before you assume something one person said also holds for the majority of your target audience. It’s a matter of two emails you send to your client after you finished the job. Don’t say something like “Could you please give me a testimonial?” This rarely goes well. People start to ramble or say things that aren’t helpful at all. What a specific and trustworthy testimonial! How will your prospects know you didn’t bribe your grandma to write that (and by “great” she meant “told me a joke”, and by “working”, “mowed my lawn”)? After you did the job and you can see they are happy with it, send an email asking if it would be ok for you to send them a couple of follow-up questions. In 99,99% of the cases they will say “yes”. What problems did you have with thing X before? What did you want to achieve instead? What made you look for the solution? What were your reservations before getting in touch? I did thing Y for you. Could you please describe how you found the process of working together and the results? What changed in your life / business now, after I did this thing Y? You don’t have to ask all questions all the time because sometimes they have sent you such a detailed inquiry and you had such a long conversation before sealing the deal that you know everything there is to know about their pain points already. So you only ask the questions to retrieve the info you still don’t have to fill that Excel I described. Where else can you get this info if not from testimonials? Want to send fewer questions to your clients at the end? Ask questions in the pre-sales conversations and during the discovery period. For example, for every new client who wants a homepage or a website review, I send out a questionnaire to learn more about their business model, target audience, and current struggles. The “current struggles” section then contributes to my master Excel. 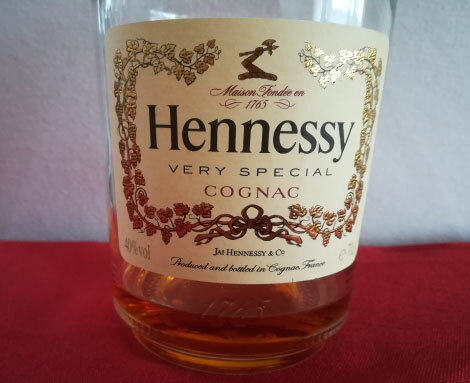 Remember the “very special” Hennessy story? They’ve obviously made their customers fill out some questionnaires. But imagine, what would happen if they just brainstormed it among their marketing people. – How about we just write ‘very special’ on it? Uncontrollable laughter for the next 5 minutes. After work, Steve spends two hours in a bar drowning his embarrassment in alcohol whispering “Well, you are very special to me!” to a bottle of Hennessy he’s hugging. You may think a phrase is mundane. Nothing special. Yet, for your customers and prospects it can make a difference between some random blah and a magic feeling of you reading their thoughts. Still struggling with words for your website? I can review your copy or write new copy for you.